9th November 2002 ride to Middlerigg Tarn. 9th November 2002: A ride to Middlerigg Tarn. 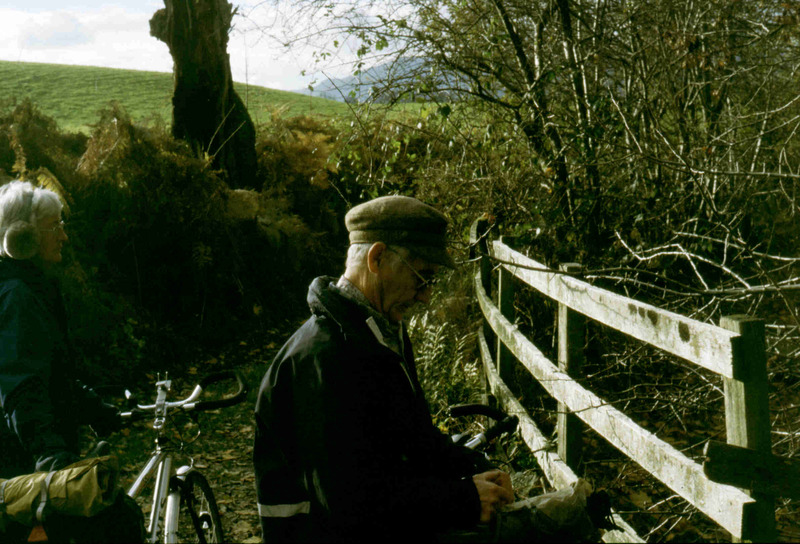 I met Fred and Pat at the Kendal Leisure Centre Car park, we head off down the cycle path towards A684 and then follow the path on the river side up to Kentrigg. Where we join the tarmac and follow the B road through Burnside, Bowston. Then continue along Winter Lane to the A591, where we join the cycle track, which we follow towards Staveley and head in towards Staveley to stop at Wilf’s Cafe. After tea and toast we head across the court yard to that well known cycle superstore to look for bargains, where I nearly bought a new bike but it was to small ( it was Dawes hybrid being sold off for £150). So after the bargain hunting we headed off out of Staveley, joining the cycle track along the A591 again and a mile or so, we turn off at Hill Farm just after Ings. We then make our way through the lanes over Moor Howe and into the Troutbeck Valley. We then cross over the A592, to our first true track of day, where we met some more off-road cyclists who were coming the opposite direction to us, so we stop to chat and tell them about the Fellowship and if had some of Phil Cunningham application forms which he did a few years ago, we would of handout these to them, but we didn’t, so we told them about the website and said our goodbyes and we head off down the track. The last time I had done this was at one of Geoff Newey’s Christmas Parties at Troutbeck Youth Hostel. So we were surprise to see, two newly constructed foot bridges to cross Trout Beck, we then continue up the track and crossing over Bridge Lane, we then follow the track up to Holbeck Lane which we follow for about 500 yards before turning on to Wain Lane. We then freewheel down the track, for about a third of the way before stopping due to stony condition of the track ( if thinking of doing this track it one for the summer months as its well use by the horse riders). We stop for lunch by Middlerigg Tarn which is well fence off from the general public as it look like its use for private fishing, with a big fishing lodge at the bottom end of the Tarn. 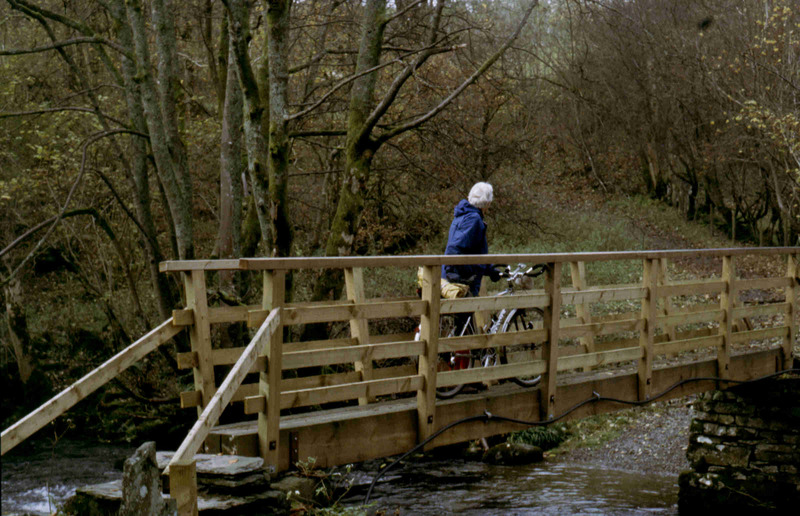 After lunch we continue on down the track which you can ride from the Tarn on wards, we then pass over a small beck using one of the small Lakeland pack horse bridges which worth a look at if you passing. So on reaching the great race track of the Lakes the A591, we headed down the road to Brockhole Visitor Centre, so that the President could exchange a jumper. So after leaving Brockhole Centre (which is worth visiting on a wet day in the Lakes), we headed back down the A591 to Troutbeck Bridge, where turn off at the Hotel up the steep road to the A592, with a few stops to look across Windermere and to see the Lakes at the Autumn best. We then cross over the A592 on to white road runs in between the two half’s of the local private school. On jointing the tarmac again we made our through the lanes back to Kendal via Ings and Staveley.